The computer is being used by three users (+1 admin) and they use unity login. The three users come, use the computer and logout. I have to give some instructions, news and details every time they login. I want to have a utility/tool where I can type in a custom message to each user. The latest message would then be displayed on the desktop (for each user) (with date of my last edit) for say 10-15 secs. A copy of the text also be available (to the user) somewhere with all messages and dates like a log. *Admin has SSH access to the system. I am not sure if this is possible (and may be I am looking for too much !). Create in a (any) directory, in which each of the users at least has read permissions, for each user a message file, exactly named after each user's username (log in name), no extension, e.g. Add text to the file as your message. If you add a new message, start with ###, the script will then automatically display the last message. The text can contain anything you like, it will look exactly like you put it in the file. The latest message, will be copied as latest_message.txt to the user's home directory for reference. As it is, the window will stay for 15 seconds, but you can set it to any value, even make it automatically depend on the length of the text. Een aap op een fiets, hoe vind je zoiets? Geef antwoord op de vraag! 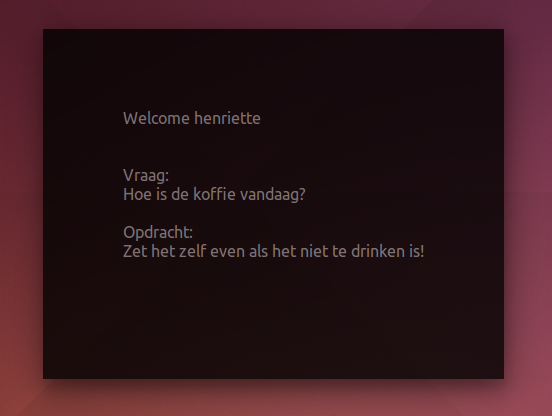 Hoe is de koffie vandaag? Zet het zelf even als het niet te drinken is! Exec=/bin/bash -c "sleep 10 && show_personalmessage"
The sleep 10 is to make sure the desktop is "ready" to open the window. Launchers in /etc/xdg/autostart run commands for each user on log in. 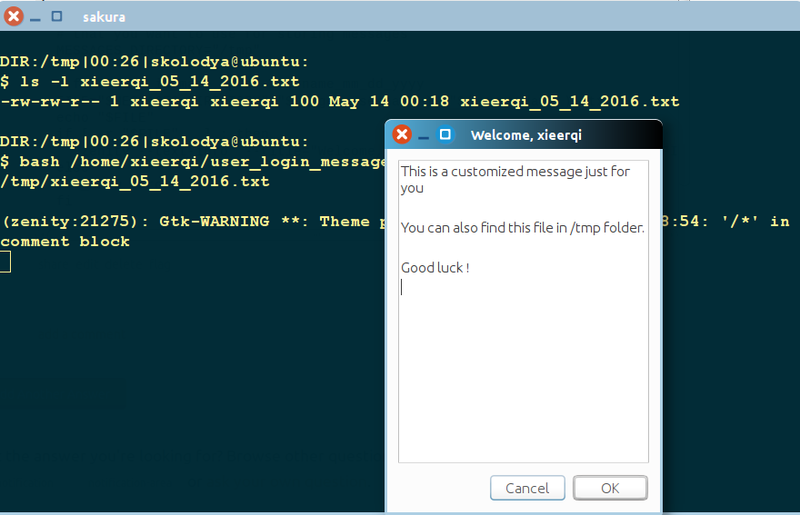 The launcher then runs the window (called by the command show_personalmessage), which looks for the personalized message in the directory you defined. Additionally. The most recent message is copied to the user's home directory. If required, the path to the message can be altered, even be made user specific by using the getpass -module, so that the script (window) will look for a user- specific named file in a directory. Please mention if that would be required. postmsg, which comes as the bottom section of your message. Both sections can be set to none, just by setting "" as a value. 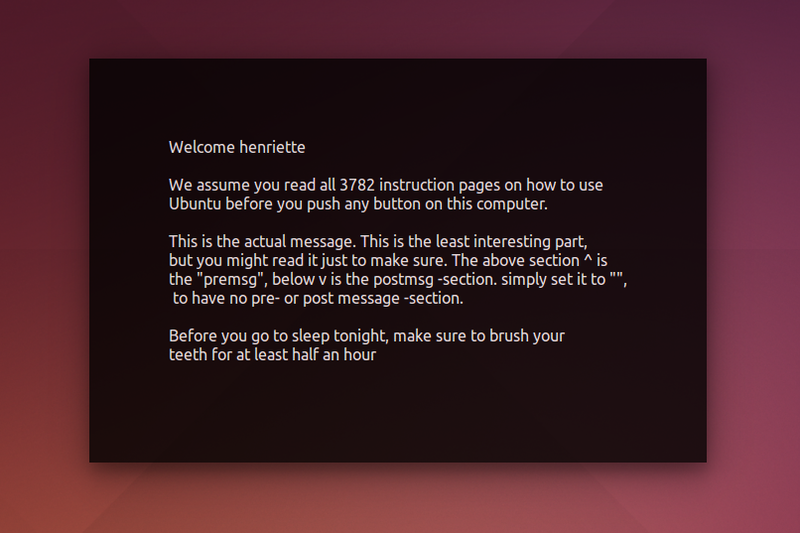 Ubuntu before you push any button on this computer. Of course, just like the message body, yoy can alter the script to read the pre- and post messages from a file, which makes it even more convenient to maintain. Did it like this, for reasons of simplicity in the answer. The script bellow allows admin to store personalized messages in form username_mm_dd_yyyy.txt in admin-defined directory. Usernames are determined automatically and matched against filename and date of the file to be displayed. The script can also have a .desktop entry which is to be placed into /etc/xdg/autostart directory . That will make the script to be displayed for each user. Alternatively you can place the .desktop file into each individual user's ~/.config/autostart directory. MESSAGE="Can't read the file or file doesn't exist. Contact the admin for assistance"
zenity --error --title="Ooops, something went wrong!" --text="$MESSAGE"
zenity --text-info  --title="Welcome, $( _get_username )" --filename="$FILE"
Not the answer you're looking for? Browse other questions tagged unity login customization notification notification-area or ask your own question. How can I display text from a file automatically after powering up my computer, in text editor or terminal? How can I make a script run automatically after gdm login and logout? What are the criteria for a user background to become login background on user selection? How to enable root login again after changing password?